It’s been a while since we released TamoGraph 5.0, but we’re finally ready to deliver the next version of TamoGraph for Windows and macOS, a software tool for Wi-Fi network planning and site surveys. We’re putting the finishing touches on it, and you’ll be able to download the new version before the end of April. What’s New in Version 6.0? A new dashboard that displays real-time signal levels for a selected SSID or selected APs, scanner status, scan cycle duration, and number of visible APs. Reports can now be saved in editable ODT (OpenDocument Text) format, in addition to PDF and HTML. The ODT files can be edited in Microsoft Word or OpenOffice. 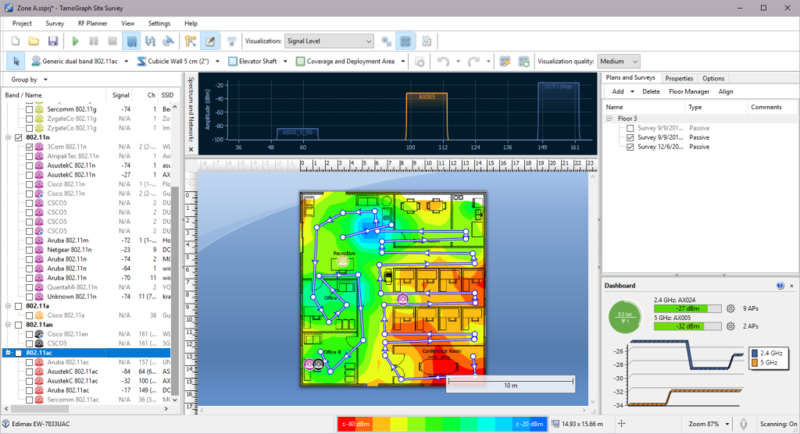 Multilevel undo and redo in the RF virtual planner. You can now copy and paste virtual objects. A new custom antenna editor that allows you to create your own antenna patterns for new APs. Watch Using TamoSoft Antenna Editor on YouTube to preview this new tool for advanced users. Some cool image recognition technology there! An improved antenna selection dialog. Signal level correction is now possible for passive surveys, in case you want to calibrate your Wi-Fi adapter to make sure that its readings match a reference adapter model. You can also emulate clients with poor RF sensitivity using the Client Capabilities panel. The “Spectrum” view has become “Spectrum and Networks”: you can now see Wi-Fi network overlays on the spectrum map when you don’t use a spectrum analyzer. Performance improvements when working with large projects. You can now control what hints will or will not be shown while working with the application. The initial release of TamoGraph 6.0 will be available in English, German, Russian, and Spanish. This includes both the localized user interface and help documentation in these four languages. We’ll be adding more languages during the next few months. Order today, before the TamoGraph 6.0 release. Because TamoGraph licenses always come with one year of free upgrades and technical support, by ordering TamoGraph today you make sure that upgrading to the next version is free for you! On the release date, we’ll publish a special discount code that will give you $300 off any new TamoGraph order! Note that this offer is not valid for reseller orders and cannot be combined with any other offers, discounts, educational allowances, or promotions. How do you get the code? Just follow us on Twitter and watch for the announcement or subscribe to our newsletter. As always, upgrading to the latest version is free for anyone who has purchased the product within the last 12 months. Customers who purchased the products more than 12 months ago can order an upgrade to the latest version at https://www.tamos.com/order/upgrade/. Despite the price increase, we’ll keep the old upgrade prices for two weeks after the release date, so don’t miss your chance to order an upgrade today! We sincerely thank all those users who have contributed bug reports, new ideas, and feedback while we were working on the new version. We still have dozens of new TamoGraph features in the pipeline. We’re also working on a brand-new product for Wi-Fi professionals, but I’d have to kill you if I told you more. Stay tuned!